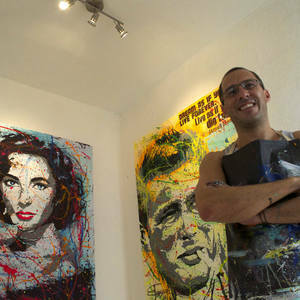 I am influenced by Jackson Pollock, and I define my style as a mix of post-modernism with a pop art style. Although my early education instilled the theoretical models of fine art, I would define myself as self-taught with an intuitive understanding of the abstract technique, especially in mixed media arts. I use a lot of dripping in my work, creating splatters that fill the images, informed with iconic faces, nice fonts, and glowing colors. My artwork must always define happiness, brightness, and all the possible means to express the way I see life. I try to show the nicest possible side of both the iconic and the 'normal' people that I paint. My lifestyle helps me to see the happiness and the good in everything that is around me! "Auction to help palestin children"
"Auction to help Indian children from Chiapas México"
Agora Gallery "The latinamerican perception"
Collective exhibition at Optimus Gallery. Happy "La Casa de los Muñecos Museum"
Centro Cultural Universitario "The art of Jazz"